Smoked cheddar cheese gives this casserole amazing flavor. It's also a very simple recipe with only 6 ingredients plus salt and pepper. Fresh minced garlic provides extra flavor. To lighten the garlic flavor, cut a clove of garlic in half and rub it over the baking dish. Or omit the garlic altogether. 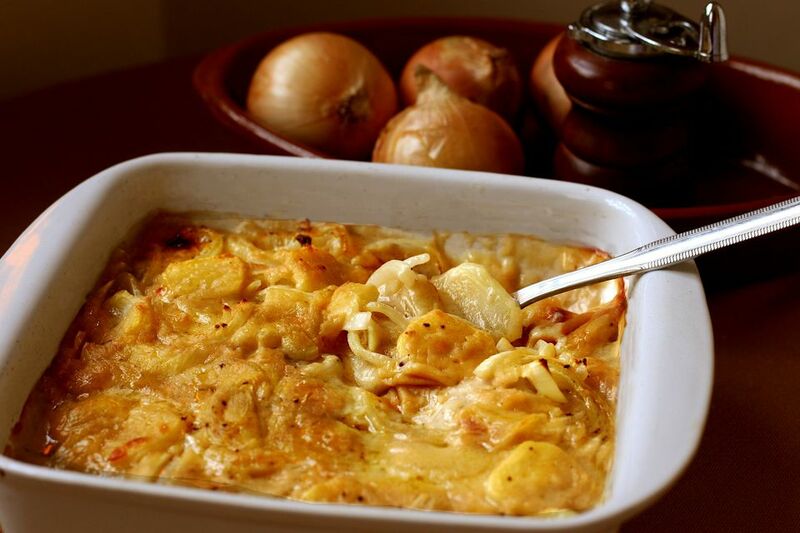 Serve this potato gratin with meat or chicken for a fabulous meal. In a small skillet or saucepan over medium-low heat, melt butter with the minced garlic; cook for about 1 minute. Strain butter into a 2 1/2 to 3-quart baking dish and swirl to coat the bottom and sides of the dish. Discard garlic. Arrange half of the potatoes in the baking dish. Sprinkle with salt and pepper and half of the cheese. Layer with the remaining potatoes, sprinkle with salt and pepper ​and then top the potatoes with the remaining cheese. Combine the cream and milk; heat until the mixture begins to bubble. Pour over the potatoes. Place the baking dish on a baking sheet (to catch any spillovers) and bake for about 1 hour to 1 hour and 15 minutes, or until potatoes are tender.